In an entertaining game and a superb advert for Cornish football at Step 7, a goal just two minutes from time enabled Liskeard to escape with a draw after Mousehole had looked to be heading for all three points to close the gap on the league leaders. The Seagulls would have probably been satisfied in advance with this result, against a team who have won ten and drawn one of their eleven matches this season, but it is a measure of their progress and ambition that they came off at the end with a real sense of disappointment. This competitive clash on a wet pitch was ably refereed by Marc Whaley, who turned a deaf ear to the frequent protests from the home players and bench, while booking two players for a series of midfield fouls, Steve Burt from Mousehole and Liskeard’s captain Jack Podmore. Mousehole’s top scorer Gerens James was missing from the starting line-up through illness, and the hosts’ James Lorenz, the Division’s runaway leading 28-goal marksman, was withdrawn injured 15 minutes from time. The games started at a fast pace with five clear openings created within the first eight minutes. Paulo Sousa shot over in the first attack after a slip by Liskeard’s goalkeeper Jamie Blatchford and three minutes later squared the ball for Hamza Kaid who shot wide. At the other end, Jarrad Woods drove over from range and then had the visitors’ keeper Dom Angove at full stretch with a swerving left-sided free kick, before James Lorenz again used his pace to put a great low cross in front of goal with no-one near enough to touch it in. The excitement continued with Calum Elliot’s drive towards the top corner pushed out by Blatchford for a corner on 15 minutes, while Lorenz produced another darting run and dangerous low cross on 17. Paulo Sousa drifted a 20-yard free kick just past the angle on 24 and Calum Elliot’s searching cross was sliced over his own crossbar by Dylan Peel in front of goal on 27. The visitors lost centre back Mark Richards through injury on 33 minutes, with captain Billy Curtis moving into the centre of defence and Tyler Tonkin coming on at right back, a change which drew Lorenz in from the left side into the middle, where he proved to be less effective. The Seagulls continued to gain the upper hand, with Hamza Kaid shooting wide twice on 38 and 43, and Kevin Nicholson curling wide in the last minute of the half after the hosts had failed to clear a corner. Mousehole started the second half on the front foot and took a deserved lead in the 50th minute. Nicholson and Elliot cleverly exposed the right side of Liskeard’s defence with some sharp inter-passing, leaving Paulo Sousa to trick his way past two defenders to slot into the corner from 15 yards. Midfielder Woods remained Liskeard’s most influential player, creating a chance on 56 minutes with a great cross and then setting up Lorenz to shoot wide from the edge of the box on 74. In the meantime Billy Curtis’ firm header from Elliot’s corner beat the keeper but was cleared off the line by Sam Gilbert, as the pulsating action continued. But the league leaders fought back with a counter-attack equaliser on 88 minutes, after Mousehole lost possession high up the pitch. The ball was quickly switched through midfield to Lyle Johnson 20 yards out and his lofted shot sailed high into the net to prompt jubilation both on and off the pitch. It looked ominous for Mousehole two minutes later as substitute Tom Cleveland burst through one-on-one, but Dom Angove did extremely well to narrow the angle and dive on the goalbound shot. 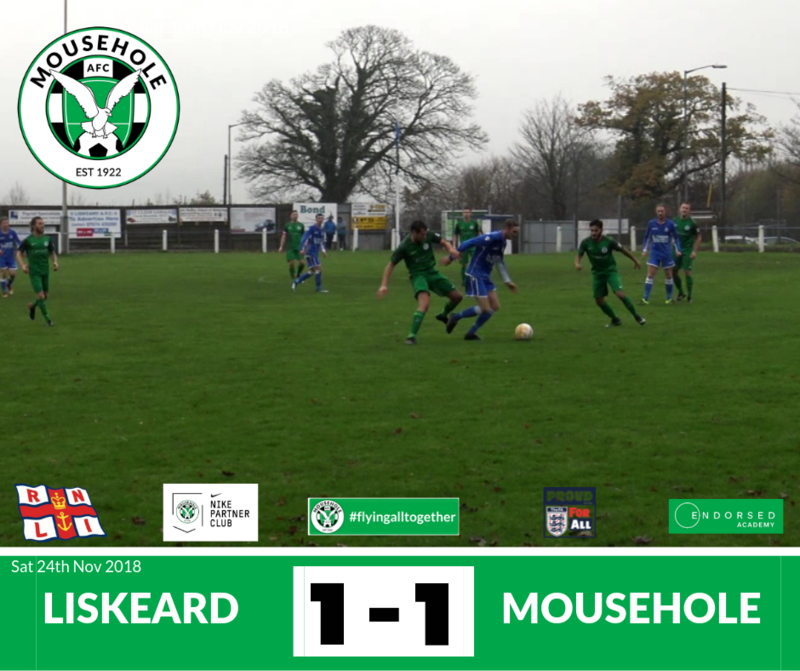 But to their huge credit Mousehole came back and were mightily close to a winner of their own in added-on time when first Blatchford made a flying save to keep out Calum Elliot’s fierce drive from inside the box, and then Lorenzo Qerimi fired wide from 18 yards. Despite dropping two points on home soil, Liskeard celebrated the result as if they had won, as they chalked up their 12th league fixture without loss to leave them 11 points ahead of Mousehole having played one game more. 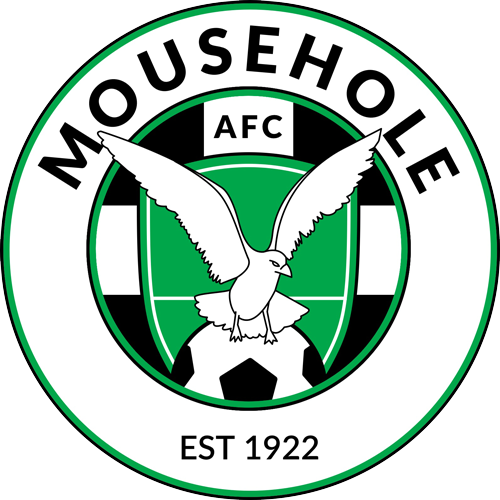 Mousehole are in local derby cup action this Saturday (1st December) as they take on Penzance at Penlee Park in the first round of the Cornwall Charity Cup, kick off 2pm with extra time and penalties if necessary. The Seagulls have lost only once in the last eight matches since the end of September, whereas The Magpies suffered a surprising 3-2 league defeat at lowly Bude Town on Saturday after gaining a highly creditable home draw 1-1 against Liskeard Athletic the week before. Mousehole: Dom Angove, Billy Curtis (captain), Ryan Andrew, Mark Richards, Kevin Nicholson, Steve Burt, Lorenzo Qerimi, Luke Hunter, Paulo Sousa, Hamza Kaid, Calum Elliot. Mousehole scorer: Paulo Sousa, 50.